泣く子はいねがぁ / “Are there any crybabies here?” may not be something you want to hear shouted through your door on New Year’s Eve, but the people of Akita Prefecture, specifically Oga Peninsula, feel differently. 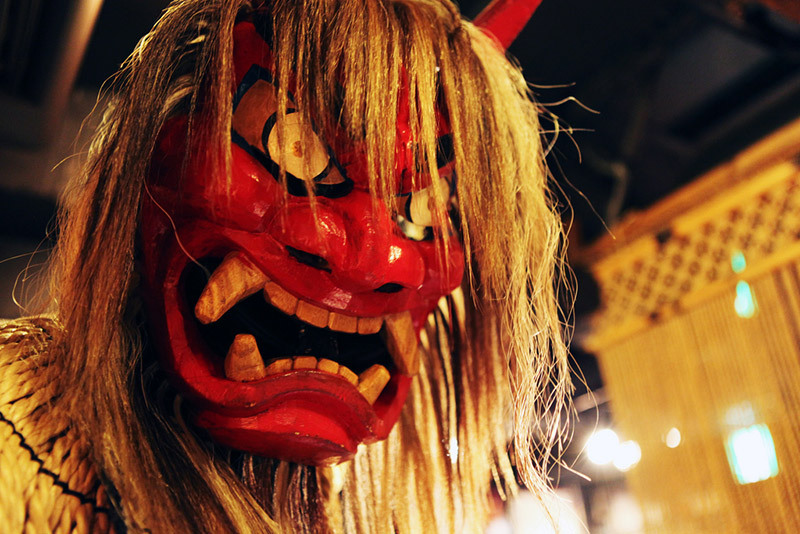 The Namahage なまはげ（）, a Japanese demon, similar to a mix between Santa Claus and the Krampus, are yearly visitors for many people living in North-Western Honshu. 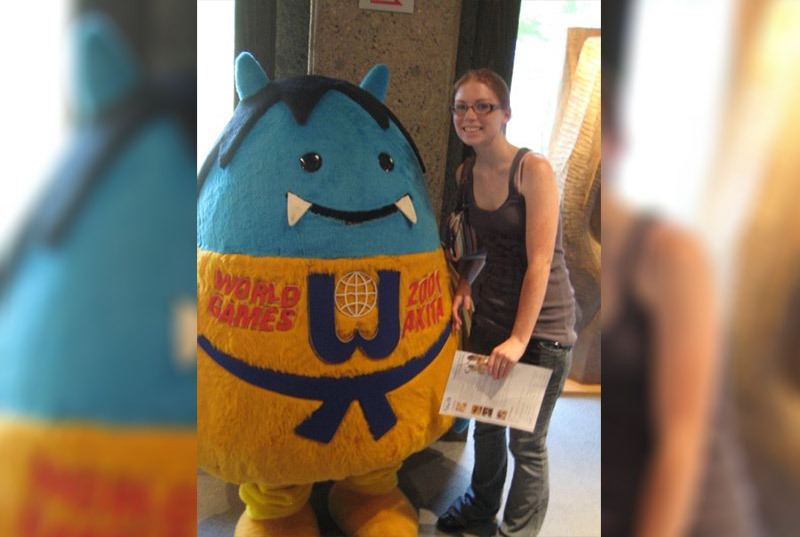 Five years ago, while studying at a school in Akita, I found myself face to face with these Namahage, on the streets, in stores, really everywhere I turned, and I couldn’t help but wonder what they were and where they came from. Eventually, I ended up at a museum dedicated to them and realized there is a lot more than meets the eye. We know traditions surrounding the Namahage have been around since at least the Edo Period (1603 – 1868) because they were mentioned in a book by travel writer Masumi Sugae during this period, but it is likely they have been around longer than that. These ogres have some pretty basic goals, at least in their current iteration. On New Year’s Eve they come down from the mountains, parade around the streets with knives held high, burst into homes, and check to see if the children have been behaving during the past year. The main things the Namahage look for are laziness, being a crybaby, and not listening to your parents. The point is, don’t be a brat. 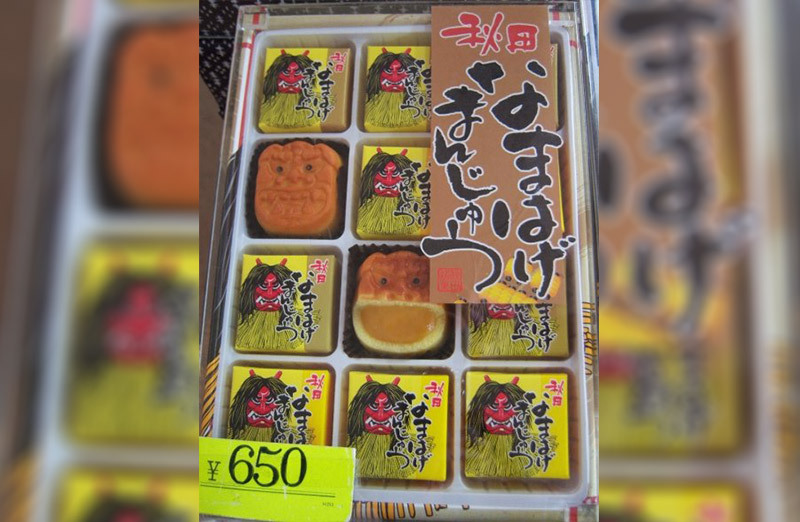 As long as you’ve been good, and your parents offer the Namahage some food and sake, they will supposedly protect your home from natural disasters, sickness, and promote good crops. They aren’t all bad. To some, especially the kids, this may seem pretty scary, traumatic even. But for parents and the young men playing the part of the Namahage, it’s a light-hearted, symbolic tradition that has been continued and protected for generations. There are a few different stories floating around about how the Namahage came to be, the most popular being the folk tale of “The 999 Stone Steps”. In this tale, the Chinese Han Emperor sent five ogres, or oni, to steal crops and young women from the villages of the Oga Peninsula, in the present day Akita Prefecture. The villagers managed to trick the oni into accepting a bet: The oni could have every young woman in their villages if they could build a one thousand step stone staircase up to the temple at the top of a nearby mountain in one night. The oni were pretty greedy, so of course they accepted. The ogres were about to start putting down the one thousandth step when a villager, pretending to be a rooster, crowed as if the sun were coming up. The oni thought they had failed and angrily marched back up the mountain and left the stairs incomplete with 999 stairs. Other legends suggest they were people from other countries who drifted ashore, or were traveling to Japan and landed on the coast of the Oga Peninsula. These people were startling to the native Japanese and spoke languages they didn’t understand, thus becoming demons in the eyes of the natives. They also could have been representatives of the god said to live at the top of a mountain in Oga. Or perhaps they were simply mountain priests who would come down to the villages of Oga to pray, and whose outfits were so fearsome from mountain living that they looked like demons. Whatever the story, Namahage are pretty scary looking. Over time, the legends surrounding them changed to the point where they don’t play too much of a part in the events surrounding them today. Usually, to become a Namahage you need to be a young man who grew up in Akita Prefecture, tormented in your childhood by Namahage. Then, once you reach the right age and show interest, you can take your turn either at one of the larger festivals or simply parade around your hometown, going to pre-planned homes. Rumor has it, you also have to be a virgin to get the part, but I can’t seem to confirm this. 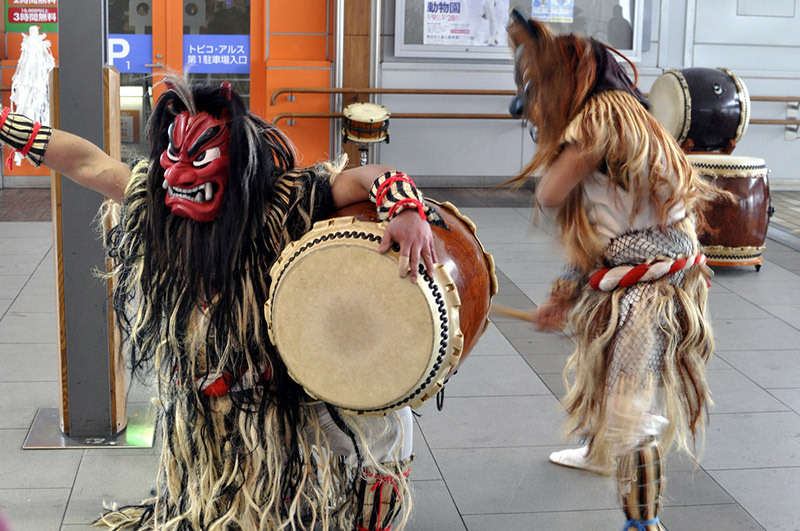 Many Namahage are also skilled taiko drummers and perform throughout the year – playing in full costume and sneering at little kids in the crowds. men 面（） – The distinctive mask, which can be made of anything from wood, paper mache, or even plastic. 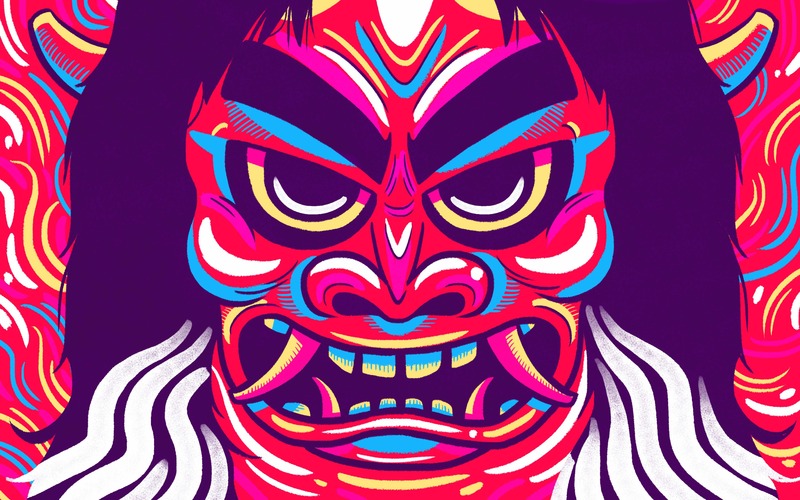 These masks vary based on where in Akita they are from, and some have some pretty distinctive styles. The ones based in Oga are the most common style. kede ケデ（） – A straw coat orcloak. Sometimes translated as a raincoat. waragutsu わらぐつ（） – Straw snow boots. It snows pretty heavily in Akita during the winter so having a way to safely traipse through the snow is important for any ogre. deba-bōchō 出刃包丁（） – A large knife, usually made of wood and painted to look like a cleaver. Once you have it all on, congratulations! You are now a menacing Namahage. But to really start your night as a fearsome ogre, you need to eat first. Before the men dressed as Namahage go off to put the local kids in their places, there is a small ceremony. 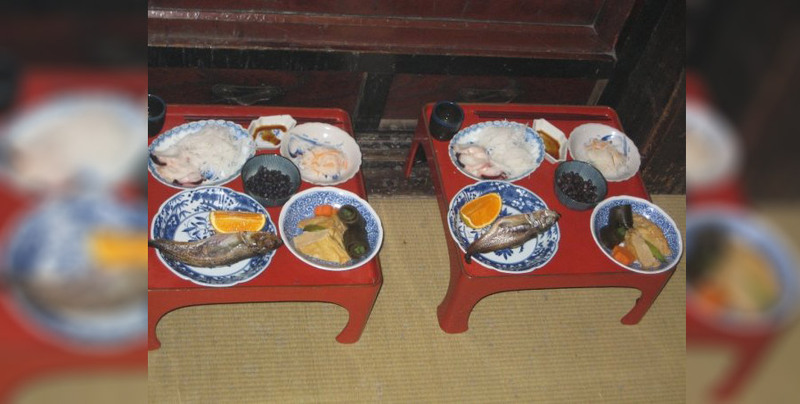 They sit before an offering of traditional Oga foods and drink sake. They then visit the local shrine (the most famous being the Shinzan Shrine) and drink sake there before stomping around outside. The stomping may seem like some kind of intimidation tactic but it’s actually a form of purification. Considering this is a Shinto tradition, it shouldn’t be too surprising that there is some method of purification involved. Along the same lines, Namahage do not go to any houses that had a birth or death in the family that past year. Those are both events associated with defilement in the Shinto tradition. The Namahage of Oga usually have a normal human with them to announce their arrival. Or they’ll have a Namahage leader who announces them instead. They stomp at the entrance (7 times when entering, 5 times before being served food and sake, 3 times before leaving) and grab whatever children are in the house. While this does tend to cause screams of こわい！ and tears from the younger kids, after the Namahage make sure they’ve been good, they bless them for the upcoming year. If you were a bad kid, meaning your parents tell the Namahage you were bad, then they will try to drag you out into the snow, but it usually doesn’t get that far. Generally, they just lean down with their masks in the kid’s face and make loud noises. According to the current legend, they’re trying to take you up to the mountain, where you’ll never be seen again. A pretty terrifying concept, and you can bet the little ones know that’s what could happen, which explains the crying. 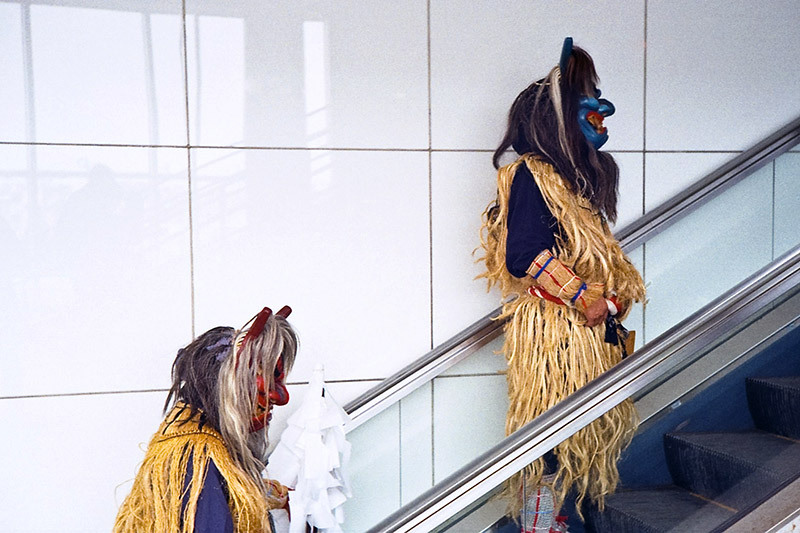 Once they’re done terrorizing, asking questions, and growling, the Namahage expect an offering and, like many folk tales in Japan, this isn’t out of the ordinary. But there are particular foods that you are supposed to serve, in order to keep your kids safe. Once again, there is sake involved, which helps the men in their costumes to keep from feeling too cold, since this does take place in winter. They are presented with traditional food, shown in the picture above. After the Namahage leave, the people of the Oga Peninsula are able to look at the New Year as a fresh start. It’s kind of like their kids’ bad attitudes are gone and they can move toward a better, new year. 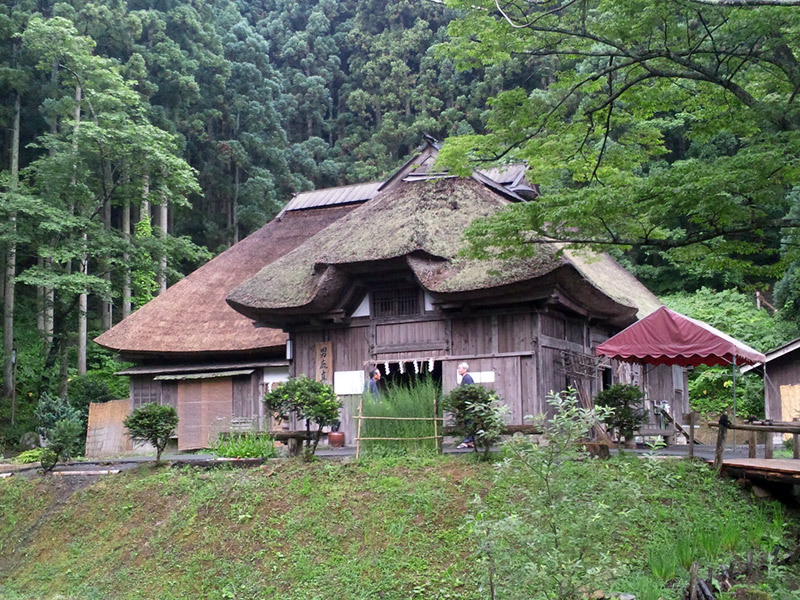 When the Namahage have visited all the houses, they go back to the shrine, tie their grass cloaks around the pillars, go in once more, and head home. 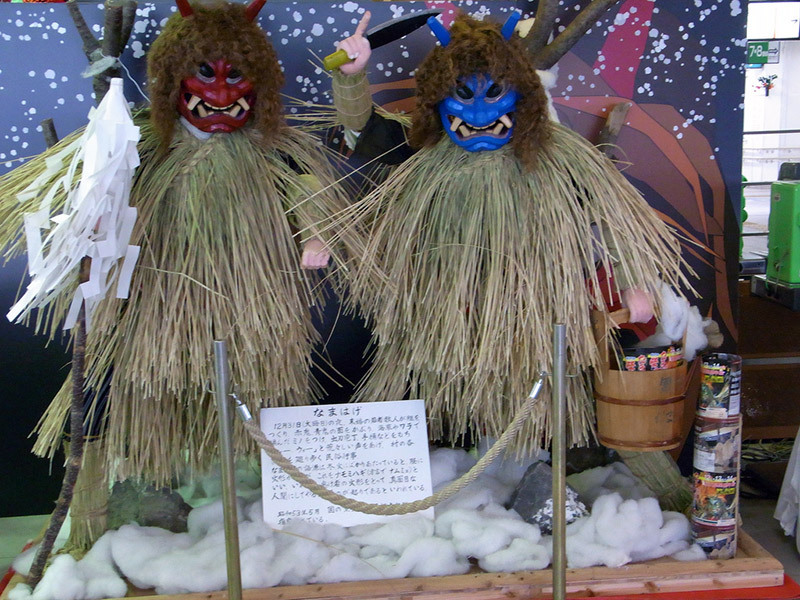 Visit the Namahage Year Round! If you’re really interested in Namahage but aren’t in the area at the right time of year, the Namahage Museum located in the Oga Peninsula is open year-round. It is a bit out of the way, an hour and a half car ride away from Akita Airport and even longer if you take the train and a taxi, but for only 500 yen for adults and 250 for students, it may be worth the trip. 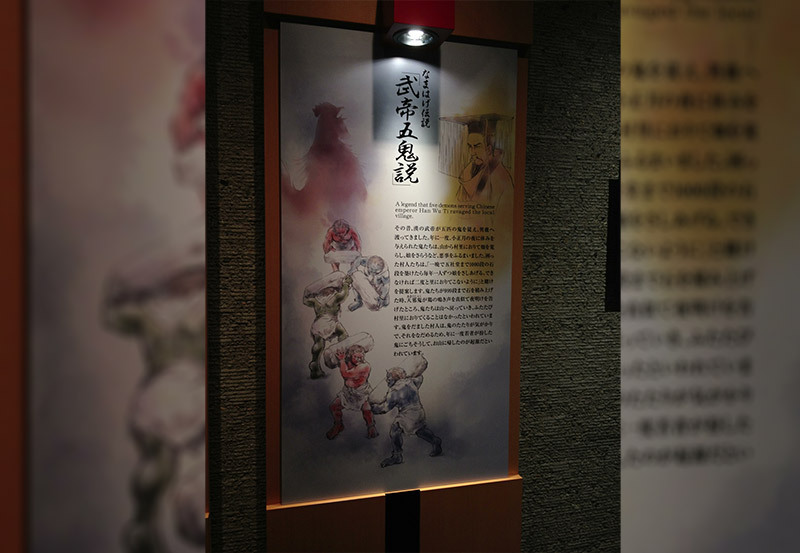 Within the museum, there is a theater which screens a Namahage documentary, a room dedicated to the history of Oga, a sizeable exhibit displaying many different kinds of Namahage, as well as a costume booth where you can dress up as one yourself. For a bit more money you can walk over to the Shinzan Folklore Museum and watch a twenty minute performance held between men and some Namahage. 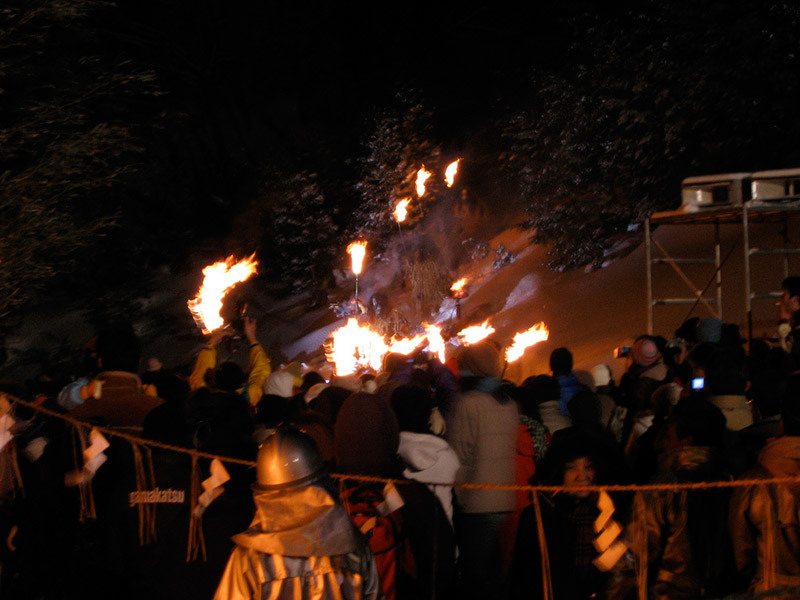 The banter between the men and the Namahage is meant to be humorous, (you can find a description of it in English here), but if you have children in your group, you may be distracted by their reactions. The parents tend to chuckle, but if screaming kids aren’t appealing, then you should probably just stick to the main museum. If you’re interested you can simply watch this recording. (Don’t worry, the museum promotes taking lots of pictures and videos.) It shows the entire performance, without focusing on little kids crying. If you’re like the parents in Akita who think crying children are hilarious, here is one with some terrified little kids. If you are already in the area, or are planning a trip, every year on the second Friday, Saturday, and Sunday of February the Sedo Festival is held at the Shinzan Shrine in Oga City. This large Shinto festival involves music, dance, performances, and lots of nervous children with their parents. Don’t worry, there are people of every age that attend the festival, so even if you don’t have your own kids to scare, you won’t be out of place. 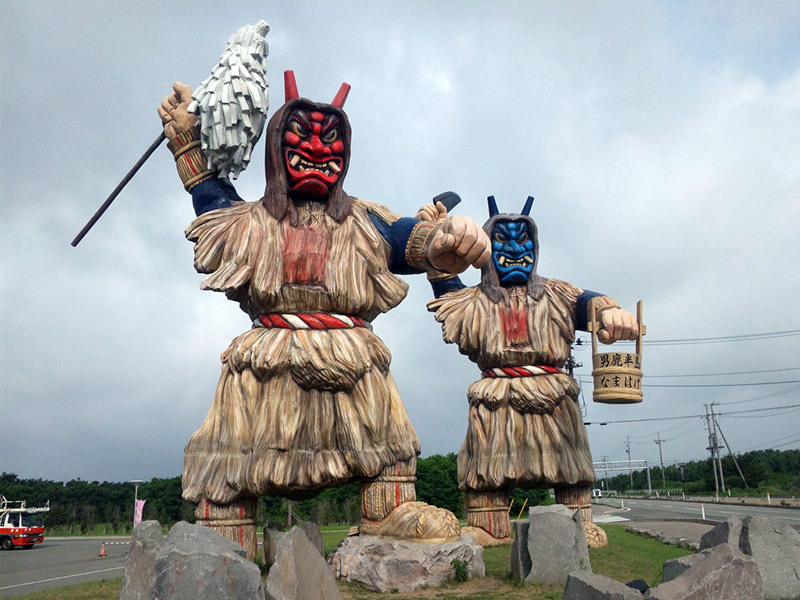 Namahage traditions are deeply ingrained in the culture of Akita Prefecture, and you can’t live or even visit there without seeing Namahage versions of everything. 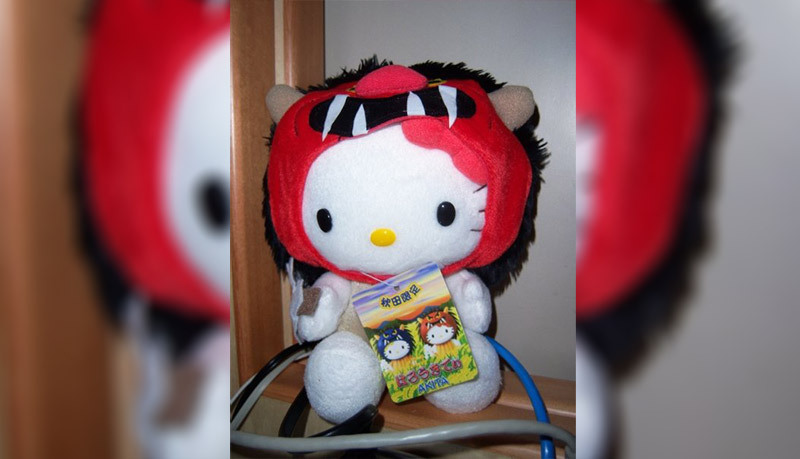 And of course, Namahage Hello Kitty! 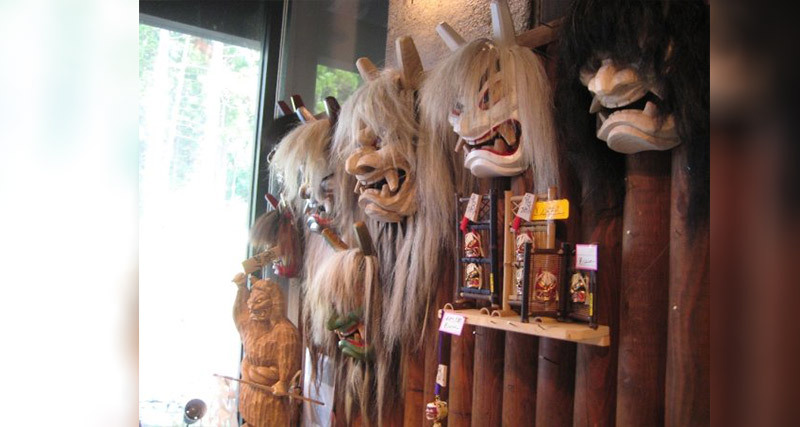 In 1978, the Namahage of Oga were officially designated as a “significant intangible folk cultural asset of the country.” This was a pretty big deal, since Oga certainly isn’t the only place in Japan to have their own demonic folklore, and, in the scope of Japan, it is a pretty small place. Remember, if you ever find yourself in Akita Prefecture, keep your eyes open and you’ll be sure to see some Namahage for yourself. Just make sure you’ve been good this year, or you’ll regret it.